Don't worry if you didn't get a Diablo 3 beta key, you could end up with two before you know it. 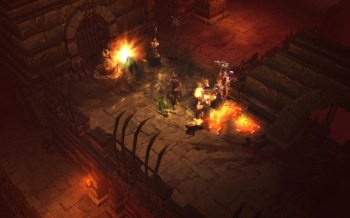 Were you one of the thousands of Diablo 3 fans who didn't get a spot in the game's beta? Well fear not, as you might still have a chance to join in the fun. Blizzard is giving away 2,000 keys to the Diablo 3 beta to lucky fans who complete an application on the game's official Facebook page. Starting on October 17th, Blizzard will select 200 winners a week for eight weeks, and each will receive a key that will allow them access to the beta. A quarter of the winners will also receive an additional key that they can give to a friend. All you have to do to be eligible for a key is subscribe to the Diablo 3 Facebook page and submit an entry via Blizzard's sweepstake app. All entries need to be in by December 12th. If you're interested in the Diablo 3, this seems like a relatively easy way of getting your hands on a key. Sure, you might still be disappointed, but it doesn't cost you anything to try and you might even end up with two. Diablo 3 comes out for PC in early 2012.